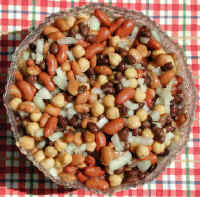 This four bean salad is made the quick and easy way with canned beans, and it's a vegan recipe that can be made in 15 to 20 minutes. Wash the lids of the cans. Open the cans and dump the contents of the kidney, pinto and black beans into a mixing bowl. Drain off the liquid in the chick pea can and add the chick peas to the mixing bowl. 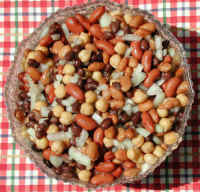 The four bean salad can be stored in a tightly covered container in the refrigerator for about two days. We can make a meal of these beans as a toping for a salad with some balsamic vinegar dressing. *An alternative is to add the balsamic vinegar dressing to the four bean salad before you place it in the refrigerator along with some pepper if you desire to the four bean salad to be a little spicy. This way the bean salad is ready to eat as is, and it can become the dressing for a mixed greens salad.